LAS VEGAS -- Hockey fans arrived on the Las Vegas Strip in the crisp desert afternoon, gathering in jovial groups outside the rink. Many wore the striking, multicolored jerseys of the Vegas Golden Knights, the NHL expansion team playing its historic first regular-season home game Tuesday night. Less than a mile south on the Strip is the massacre site where 58 people were killed and hundreds were injured just nine days earlier. Another short walk down the road, dozens of crosses and heartbreaking memorials sit in the median near the iconic "Welcome to Fabulous Las Vegas" sign. Nobody's mind was entirely on hockey during what should have been a celebratory night and a milestone for Las Vegas, which finally has its first franchise in the major North American pro sports. Instead, the Golden Knights and the NHL kept the tragedy in the forefront while attempting to provide their own modicum of momentary relief to a healing city. "I wasn't going to miss it," said Joan Simmons, a Las Vegas native wearing a brand-new Golden Knights T-shirt with the tag still attached. "I think we all need hockey right now." The home opener against the Arizona Coyotes originally was planned as a glamorous, Vegas-style debut featuring a light show and a pregame extravaganza packed with visual marvels building on the team's medieval nickname. After the shooting, the team modified its plans and dedicated a quieter evening to the victims, the first responders and the survivors. 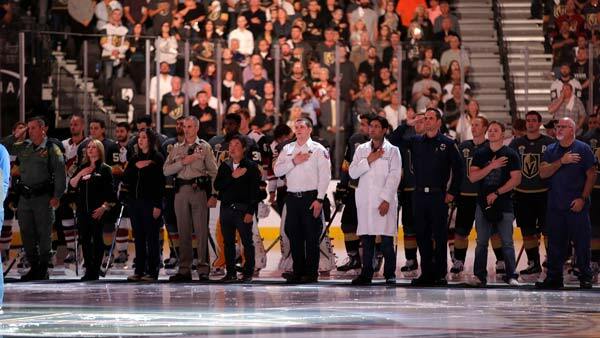 After a stirring pregame video with stark images of Las Vegas and its heroes, the Golden Knights took the ice for pregame introductions, each accompanied by a member of the medical and law enforcement communities. The Coyotes lined up behind the Golden Knights while the sold-out arena roared. And then the arena illuminated the victims' names on the ice in gold while counting 58 seconds of painful silence. "Like all of you, I'm proud to call Las Vegas home," Engelland said. "I met my wife here. My kids were born here, and I know how special the city is. To all the brave first responders that have worked tirelessly and courageously through this whole tragedy, we thank you. To the families and friends of the victims, know that we'll do everything we can to help you and our city heal. We are Vegas Strong." T-Mobile Arena had no ads on the boards around the ice for the opener. Instead, the all-white boards simply displayed the same message: "Vegas Strong." NHL Commissioner Gary Bettman said the game "shows what a major league, professional sports team can mean to a community in terms of bringing people together, uniting them, helping them heal from a tragedy and demonstrating the power of distraction when everybody comes together." And when the puck finally dropped, the Golden Knights provided the best distraction of all by playing spectacular hockey. Vegas scored an incredible four goals in the first 10:42, setting off delirious standing ovations. Tomas Nosek got the first goal , and Engelland quickly added his first goal for his hometown team. James Neal, the veteran forward who scored the first goal in franchise history last week and the game-winning goals in both of the Knights' season-opening road victories, got two more goals in stunning succession. Before the game, the players walked a gold carpet into the arena, cheered on by those early-arriving fans lining the walkway. A fan festival was canceled, and many of the elaborate festivities scheduled for the opener have been delayed until the Golden Knights' second home game on Friday, when the Detroit Red Wings visit. But after years of work and months of anticipation, the NHL's 31st franchise is officially in business in this gambling mecca, albeit in muted circumstances. The Golden Knights even won their first two regular-season games on the road shortly after the shooting, building anticipation for the return of the players who never forgot about the city waiting for its return. Goalie Marc-Andre Fleury was among several players who experienced anxious moments on Oct. 1. The team had a preseason game earlier in the day, and Fleury knew several teammates had gone out on the Strip that night, perhaps to the country music festival. Fleury didn't stop worrying until he got texts back from his new teammates. "You don't want to have to face those tough situations," Fleury said. "Vegas is such a huge town, a lot of people living around here, but it didn't feel that way (after the shooting). Everybody was trying to do whatever they can to help out around here. You feel proud to be part of a city like that." The home opener was the biggest milestone yet in the quest of owner Bill Foley, whose pursuit of an expansion franchise gathered steam in late 2014. Las Vegas was the largest metropolitan area in the U.S. without one of the four traditional major professional sports, and Foley paid $500 million for a franchise to play at T-Mobile Arena, which was already under construction. The Golden Knights aren't leaving town for the next three weeks. Their meeting with Arizona was the opener of a seven-game homestand. The players and coaches hope they can play a role in a return to normalcy. "There's no other way to describe it: It's a tragedy," Bettman said. "It's sad. It's horrific. But there's a healing process, and life is apparently moving on. From walking around here today, from being in cars with drivers, from checking into the hotel and interacting with people in restaurants, that's the sense that I'm getting. People are horrified by what happened and are determined to move on."